The Scottish Greens have formally voted to participate in the cross-party Yes Scotland campaign for independence. Delegates backed the movement at their party conference in Glasgow, some four months after Yes Scotland was launched. 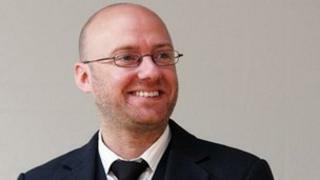 Green co-convener Patrick Harvie said the decision "ensured Greens take a front-row seat in this exciting debate". But the party also reasserted its strong opposition to an independent Scotland remaining part of Nato. Speaking after the vote, Mr Harvie said: "Today's decision ensures that Greens take a front-row seat in this exciting debate, promoting fresh and radical ideas on Scotland's future. "Greens are not nationalists, and we're not motivated by devotion to one flag or the other. But we can see huge opportunities to make our country fairer and greener. "We look forward to working with Yes Scotland to set out a transformational vision for Scotland's society, economy and environment, and building a campaign to win." The party also decided to form its own pro-independence campaign to run alongside Yes Scotland, designed to promote distinct policies. Mr Harvie helped launch Yes Scotland alongside First Minister Alex Salmond, but was later quoted saying he was disappointed that the SNP had failed to create an "all-inclusive" campaign. This was now no longer the case, Mr Harvie said, with Yes Scotland no longer dominated by the SNP and having "evolved into the sort of organisation it should have been from day one." Mr Harvie said the Greens remained "steadfast" in their opposition to Scotland remaining in the "Nato nuclear club" and stressed the party's opposition to "committing billions of pounds on an outdated approach to defence". He added: "Over the next to two years we will argue for a vision of Scotland as a peaceful country with social justice, equality and environmental protection at its core". Welcoming the decision by the Greens, Yes Scotland chief executive Blair Jenkins said: "The momentum is very much with the Yes campaign and this extremely welcome development is another tremendous boost as we continue to build the largest community-based campaign in Scotland's history." Campaign chairman Dennis Canavan, a former Labour politician at Westminster and Holyrood, added: "Yes Scotland is a very broad and inclusive church, comprising people with many shades of political opinion and none but united in their belief that independence is the best option for Scotland and the Scottish people. "I am thrilled that the Scottish Green Party has decided to play its part in the Yes campaign and I know they will play a key role in helping to deliver independence in the 2014 referendum."